Happy Election Day! Our recently updated Yale Climate Opinion Maps allow us to analyze gaps between public opinion and political will at sub-national scales, making it easier to explore the role climate change and energy could play in the 2018 election. This analysis focuses on competitive Congressional races in which climate and energy are part of the platform of one or more candidates, or where candidates are not talking about these issues, despite strong views by their constituents. In the tight Congressional race for Iowa’s first district, the Democratic challenger and the Republican incumbent have sharply diverging stances on environmental issues and policy solutions, specifically regarding climate change. In Iowa, the heavily agricultural economy has been hit by Chinese tariffs on exported agricultural goods, imposed in response to President Trump’s trade war. These tariffs have cost Iowan farmers an estimated $2billion. Iowans are also increasingly experiencing the impacts of climate change through drastic shifts in the severity and frequency of extreme weather events, which cut into major commodity crop productivity. This further challenges the livelihood of Iowans reliant on the agricultural economy. Abby Finkenauer, a Democrat currently serving in the Iowa House of Representatives, is challenging incumbent Rod Blum, a Republican who has served Iowa’s 1st in the House of Representatives since 2014. By comparing the stated views and policy platforms (and, when applicable, voting behavior) of these two candidates, while also noting the opinions of constituents as reported by the Yale Climate Opinion Maps, this analysis explores the gaps between constituents’ and candidates’ support for climate policies. Blum, the incumbent, has demonstrated through his public statements and Congressional votes that he doubts that climate change is happening and human-caused. A self-proclaimed global warming skeptic, Blum argued in a 2014 interview that the period of public concern over “global cooling” in the 1970s is sufficient reason to doubt the scientific consensus on human-caused climate change. Blum’s views on global warming do not represent those of his constituents: 70% of adults living in Iowa’s 1st district believe that global warming is happening, and just 14% say they do not. A majority (58%) of his constituents say that global warming is caused by human activities, while a minority (32%) do not. In Iowa’s 1st district, 58% of adults say they are worried about global warming, while 42% say they are not; 56% believe that global warming will harm U.S. citizens, while 34% do not. While a majority of Blum’s constituents report being concerned about climate change and its impacts, Blum’s voting history indicates that he does not consider climate change to be a problem. For example, in 2015, Blum voted for several amendments to a bill amending the National Environmental Policy Act to restrict the Federal government from considering climate change in environmental reviews. One amendment prohibited federal agencies from following guidance from the White House Council on Environmental Quality about the inclusion of greenhouse gas emissions and climate change impacts in their own NEPA reviews. He also voted against an amendment which would have required federally funded construction projects to consider risks from climate change, flooding, and wildfires. 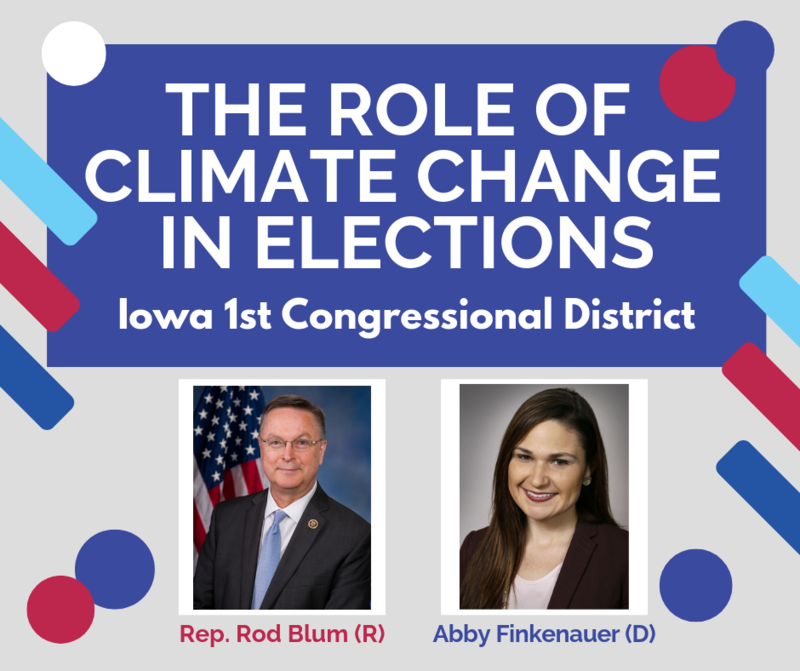 Blum’s challenger, Finkenauer, has explicitly stated that she shares the perspectives of the residents of Iowa’s first congressional district about climate change. Finkenauer supports the U.S. staying in the Paris Agreement and describes President Trump’s decision to propose withdrawal as “disastrous.” She has also expressed concern for the harm that Iowans will suffer as a result of climate change, especially in the agricultural sector, and has cited research which shows that inaction on climate will cause economic harm to the 1st District. Blum’s voting record has earned him a lifetime score of 2% from the League of Conservation Voters, indicating an almost total lack of support for legislation protecting the environment in general. For example, Blum was a supporter of the Keystone XL pipeline and voted to approve its construction in 2015. While Finkenauer has verbally expressed opposition to policies that would harm the environment and has been endorsed by the League of Conservation Voters Action Fund, she has thrown her support behind the Dakota Access pipeline and accepted a $500 donation from its parent company, Energy Transfer Partners. Iowa gets nearly two fifths of its energy generation from renewable energy, and clean energy production is a large source of jobs in the state. In Iowa’s 1st district, 85% of citizens support funding research into renewable energy. As Chair of the House Subcommittee on Agriculture, Energy, and Trade, Blum has voiced support for an energy strategy which uses “all domestic resources, including coal, oil, natural gas, hydro and nuclear power, wind, solar, and renewable fuel sources.” He has supported renewable energy in the past: in 2015, he voted against an amendment to strip funding for the Office of Energy Efficiency and Renewable Energy at the Department of Energy. Finkenauer has explicitly voiced support for policies that would expand Iowa’s clean energy sector, citing the benefits of additional jobs in clean energy production and manufacturing, as well as emissions reductions. She also points to her watchdog role in the Iowa state legislature, where she opposed efforts to undermine renewable energy research. Blum opposes regulating carbon dioxide as a pollutant – a policy which 77% of adults in Iowa’s 1st district support. In 2016, he voted to prevent federal agencies from factoring the social cost of carbon emissions into their rulemaking and guidance documents. Finkenauer has stated that she will fight efforts to undermine climate action if elected. Today’s election could be a critical inflection point for both the politics and policy of climate change in America. Our research indicates that there is often a gap between what Americans think about climate change, what climate and energy policies they support, and what their elected representatives in Congress are doing. Iowa’s 1st District may be a race to watch today, and the midterm results may indicate that voters prioritize policies that take action on climate change.